We mentioned another very good piece being read at the time (Wayne Barrett’s Village Voice: Bloomberg Maneuvers to Crown a Kennedy: Who's Caroline's daddy? January 13th 2009). That piece similarly dealt with concerns about Mr. Bloomberg, doing so extensively, and brought up term limits as negatively emblematic of concern. 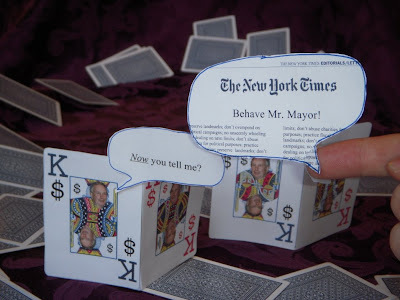 We have pointed out that the New York Times editorial page has its work cut out in terms of catching up with Mr. Bloomberg’s misconduct (Saturday, November 15, 2008, The Mayor, The Times’ Timing, and a Proper Ordering) and that the Times’ editorial page’s misstep in prematurely endorsing Mr. Bloomberg’s third term aspirations is a big part of the problem. Although Ms. Kennedy cited personal reasons for withdrawing it is not at all clear why exactly she withdrew. It could easily have been as simple as this: Her experiences in pursuing the office could have been driving home just how stressful the conflicts of political ideology and power-struggle agenda can be. . .
. . .Each of our posts on Ms. Kennedy worried over the possible influence of Mayor Michael Bloomberg over Ms. Kennedy. In the most recent we noted Wayne Barrett’s Village Voice piece, Bloomberg Maneuvers to Crown a Kennedy: Who's Caroline's daddy? (January 13th 2009) which makes a strong case that Mr. Bloomberg was hoping Ms. Kennedy will be his pawn. We were concerned about Mr. Bloomberg’s possible influence over Ms. Kennedy, but here is what we can point to with hope. This hope is what we were in fact writing when Ms. Kennedy’s withdrawal made news. We already wrote about the Obama Future (in our first post about Ms. Kennedy), expressing hope that she will follow in the new directions in which we believe he will lead. We could not help but have these thoughts once more as we listened to Mr. Obama’s inauguration speech. Therefore while we had a fear that Ms. Kennedy would be politically led astray by Mr. Bloomberg, there was hope that she would instead chose to follow Mr. Obama in an entirely different direction and, as we listened to Mr. Obama’s speech, we heard things about direction he told us the nation would be taking that perked up our Noticing New York ears. We set them forth here. If you need any help interpreting our Noticing New York hopes, we suggest that you hold up against Mr. Obama’s hortatory remarks Mr. Bloomberg’s worst New York City project, the Atlantic Yards megadevelopment, which we and others believe should be generally accepted as the poster child for the very worst of the worst excrescences of government misfunction. Using the Alantic Yards test, we observe that Mr. Obama seems to envision a better future where with our “eyes fixed on the horizon” we will see no Atlantic Yards. . . . . That we are in the midst of crisis is now well understood. . . . Our economy is badly weakened, a consequence of greed and irresponsibility on the part of some, but also our collective failure to make hard choices and prepare the nation for a new age. . . .
Atlantic Yards is clearly an example of the worst kind of greed, but it is also an example of the kind of irresponsible diversion and misdirection of resources that has crippled our economy. Yes, the greed is on the part of private developer Forest City Ratner, which wants to monopolistically own over 30 contiguous acres of Brooklyn, and the firm that designed a superdense medgadevelopment to act as the maximum possible subsidy sponge. Perhaps most egregious is Ratner’s proposal that over a billion dollars of public subsidy pay for a basketball arena that would be essentially privately owned by them and in which negligible or no private money would be invested. But the greed is also on the part of politicians like Brooklyn Borough President Marty Markowitz, Mayor Michael R. Bloomberg and Assembly Speaker Sheldon Silver, who take his money for political contributions and for charities they use to help secure their political power. The greed is also on the part of groups like ACORN that negotiate no real benefit from such projects for the public while promoting their own self-enhancing agenda and accepting significant secret money from Ratner. And yes, Atlantic Yards is modeled on long-discarded “urban renewal” models. Part of the justifications relied upon to legally argue for Atlantic Yards in court is that it is adjacent to an urban renewal area created 40 years ago. Urban renewal folly was based on dogma that was worn out and discarded decades ago.
. . . the time has come to set aside childish things.. .
“Childish” is one word that comes up in Isabel Hill’s “Brooklyn Matters” documentary to describe the proposed Atlantic Yards arena. Specifically the film described the kind of knee-jerk senselessness that wealthy subsidy-collectors like Ratner try to engender from the public so as to take advantage of them in constructing sports stadiums and arenas. It is this childishness that is relied upon for the misplaced focus where public taxpayer resources are diverted to pile subsidies onto already wealthy sport team franchise owners. When it comes to real estate development, the Bloomberg administration is always looking to get something for nothing and, not surprisingly, what we ultimately get is nothing as a result. Over and over again the Bloomberg administration has been interested in the short-cut of placing huge tracts of land into the hands single developers without adequate public participation or effective bid. The hole created in the urban fabric by Atlantic Yards is only one example. Other examples of failure are: West Harlem, Coney Island, Willets Point, Hudson Yards, the Moynihan/Penn Station area, and Ground Zero. The public is the poorer for these abdications of responsibility. To whom then do the pleasure of unfairly created riches go? To the likes of Ratner!
. . . But our time of standing pat, of protecting narrow interests and putting off unpleasant decisions - that time has surely passed. Starting today, we must pick ourselves up, dust ourselves off, and begin again the work of remaking America. Again, what better example of serving a narrow interest can one cite than government’s artificially bequeathing a 30-year, 30+ acre monopoly on the development of prime parts of Brooklyn to Mr. Ratner? Nor is the question before us whether the market is a force for good or ill. Its power to generate wealth and expand freedom is unmatched, but this crisis has reminded us that without a watchful eye, the market can spin out of control - and that a nation cannot prosper long when it favors only the prosperous. . . .
Atlantic Yards is an example of the kind of big government perversion of the free market that Republicans (Governor Pataki and Mayor Bloomberg, Republican when he signed onto it) adore. And although it cross-dresses in social program guise that gives Democrats (Governor Spitzer and Marty Markowitz) cover to hobnob with (and take money from) and specially favor the prosperous subsidy-grabbing Mr. Ratner, the megadevelopment is fundamentally anti-populist, anti-community and an example of top-down thievery that doesn’t work. It is the kind of megaproject whose unwise numbers and expenditures have to be kept secret because they won’t stand up to a public accounting. Rather than brave the “light of day,” Atlantic Yards avoided, rushed through and rigged every public process which stood in its way. We know that this is about the way that the Bill of Rights has been sacrificed in the name of national security. We know that this is foremostly about Guantanamo and unwarranted public surveillance. But it is easily about more. The same Bill of Rights protects against eminent domain abuse. Are we not now too often justifying the stripping away of this amendment’s protections against the seizing of property for careless convenience sake and a willingness to let “majority rule” conceptions trounce the protection that should be afforded individuals? And isn’t it in the end a similarly “false choice,” because aren’t the economics that will serve us best those where we don’t let a subsidy-grabbing Forest City Ratner displace the market’s natural “power to generate wealth and expand freedom”? Where is Michael Ratner and where is the New York Times (similarly a Ratner business partner) when it comes to the fight for our other trampled-upon protections under the Bill of Rights? Can life be so easily compartmentalized? Do we not find cognitive dissonance here? Or is it that if you fight for one set of protected rights, you can then make money by trampling on another? Really and truly, can Atlantic Yards measure up to traditional values and good citizenship? We hold the answer to be a self-evident and resounding negative. 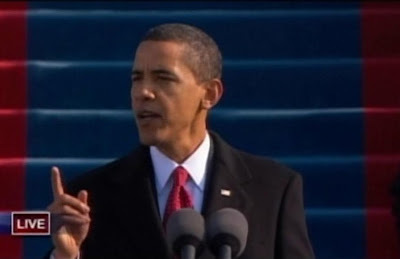 Obama’s speech was not unduly long but it was not a short one. You may think that we reacted to it like a Rorschach test, our ears selectively perking up only at what we wanted to hear, but we think the above fairly represents what is most central to the important national themes President Obama spoke of. We also believe that we have confirmation on this. We pay a lot of attention to the New York Times editorial page, both when we agree with them and when we think they are wrong and need to be corrected. After we selected the above quotes and wrote most of the above, we came across the Times editorial on Mr. Obama’s address (Editorial: President Obama, Published: January 20, 2009). We note the Time’s concurrence with us in their selection the quotes that set out Obama’s important themes for the nation, nearly all of which are much the same as our own. How can it be that the Times and ourselves think so much alike on this and so differently on Atlantic Yards? It could be because the Times has a business partner (Bruce Ratner) that we do not. One last thing: We know that Ms. Kennedy has withdrawn from consideration for appointment to the senate seat for which she campaigned. Still, having wanted to be of public service and play a greater role in the public dialogue, there is no reason not to continue in this pursuit even though Ms. Kennedy will not now be filling that senate seat. She can still further the ideals Mr. Obama has expressed. When we evaluated as part of what we would do next in our career, and weighed what was the greatest possible public contribution we could make, the answer that came to us was to do our best in joining in the fight to stop Atlantic Yards. Senator or not, this is a course we suggest to Ms. Kennedy. As an update, we should perhaps first mention what others have been writing about Ms. Kennedy’s possible appointment to the New York senate seat to replace Hillary Clinton. Atlantic Yards Report evaluated the prospect of a Kennedy appointment in, The Power Broker, 2009: Mayor Mike Bloomberg (Thursday, January 15, 2009), which is largely a review of points raised by a Wayne Barrett Village Voice piece, Bloomberg Maneuvers to Crown a Kennedy: Who's Caroline's daddy? (January 13th 2009). The Atlantic Yards Report piece also writes about a Henry Stern New York Civic piece (Why Not the Best? : Let New Yorkers Elect New U.S. Senator in 2010 Like Moynihan, Hillary; Based on Achievements, Not 2-Year Incumbency, January 14, 2009), which in turn also writes about the Barrett Piece.
. . . if Ms. Kennedy is not in the end able to recognize how bad Bloombergian style is for what ails America, we have a problem. There is also the question of recognizing how Bloombergian billionaire maneuvering on term limits was antithetical to fair play and respect for the rules by which the elected officials are supposed to honor and be accountable to the public. It represents, once again, making additional accretions of power by the privileged and powerful a priority over the common decency and respect the general public deserves. 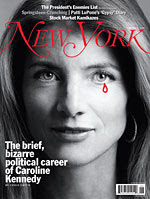 When I see Caroline Kennedy, I think Mike Bloomberg. In the contest for Hillary Clinton's Senate seat, Kennedy is to Bloomberg what the City Council was to the mayor in his term limits battle—a partner in the spoils, yes, but, ultimately, little more than a pawn in his power grab. We do not vouchsafe for Ms. Kennedy, (we noted that we did not get to know her very well), but we note that when a game of chess is played and you allow a pawn to advance all the way to the other side of the board, that pawn becomes a queen. Initially, Kennedy's candidacy rapidly gained traction, but when a backlash of negative media swelled in late December, a chagrined Bloomberg complained at one press conference that things had gotten "out of control," which was his way of saying that things had gotten out of his control. A panicky Bloomberg said Paterson should make a decision immediately, which was contrary to the single public promise the governor had repeatedly made: He wouldn't select a new senator until the old one was confirmed as secretary of state. She even failed to vote in 1994 for her in-law Mario Cuomo, when at least four other Kennedys campaigned for Cuomo in the race of his life. 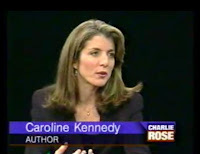 So here is the question, addressing New York’s rampant eminent domain abuse is important to Notice New York: Does the fact Caroline Kennedy has written as book with a chapter about the Constitution ’s Fifth Amendment protection against eminent domain provide a window of insight into how Ms. Kennedy, as a senator, might position herself on this important issue? We acknowledge at the outset that we are reading tea leaves. Truth to tell, though there may be a whole chapter in Ms. Kennedy’s book, more than most people have ever written on the subject, there is not much to read in these tea leaves. Not easy to know. . . Here are the problems. 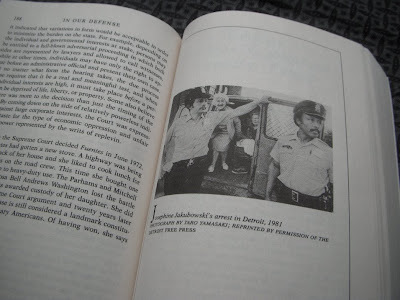 The book, In Our Defense, is co-authored by Ellen Alderman and Caroline Kennedy so it is difficult to tell how much of the book represents Ms. Kennedy’s own input. 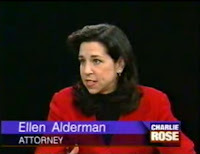 Ms. Kennedy’s co-author, Ms. Alderman, is a legal scholar. Next, the book is copyright 1991. Though our copy is a 2002 reprint and although a lot has changed affecting emient domain law since the time of the book’s original writing, our edition has not been updated to deal with significant changes. 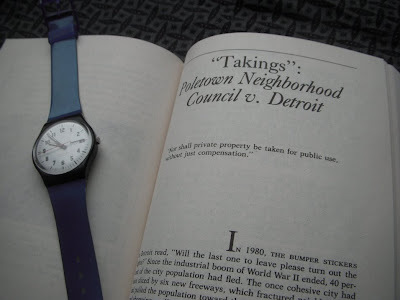 Among other things, the writing of the book antedates the U.S. Supreme Court’s critical 2005 Kelo v. City of New London case and the Michigan case that the book focuses on, Poletown Neighborhood Council v. City of Detroit, has since been reversed. She and her co-author, Ellen Alderman, completed two books about constitutional issues, “In Our Defense” and “The Right to Privacy,” . . . . . Together, the women profiled ordinary people whose legal battles had shaped constitutional rights, avoiding even a glimpse of Ms. Kennedy’s personal views. . . When Ms. Kennedy turned to more political topics, she stuck to a similar format. “A Patriot’s Handbook,” published in 2003, offers few clues to Ms. Kennedy’s political views. The stories were chosen for many reasons. Some illustrate why the Founding Fathers protected thee individual rights against the powers of the governments, and why we still need them today. Others show how far we have come in two hundred years. Still others raise difficult questions for the future. While the note goes on to say that “It is a subjective slice of an enormous subject,” it is very difficult in reading the eminent domain chapter to discern the particular subjectivity the authors are bringing to the subject. The chapter works at balancing the viewpoints on both sides of the questions raised by Poletown. We can understand the effort toward balance, but we also have significant problems with the inadequacy of this kind of he said/she said, journalism. . . within months the mayor and his staff had devised a plan to buy and bulldoze 16 churches, 2 schools, 1 hospital, 114 small businesses, 1,300 houses and to relocate 3,500 people in the process. This was because Detroit was in dire economic straits and General Motors which was closing two plants, had offered to relocate a new replacement plant in Detroit only if the city provided the land. General Motors specified what it wanted in the way of a new site and reportedly the city selected the neighborhood that would be sacrificed. Reportedly out of the 3,500 residents, there were about 300 unwilling to be bought out. Emotions . . Are Not Principles- Who is Principled? On one side of the equation the two authors of In Our Defense paint an affecting emotional portrait of those who sought legal protection against having their property seized. If the angst of having their property rights abridged were what governed, then the authors’ depiction would surely carry the day for them. But really this is not the point because whether the removal is finally justified or unjustified, removals will clearly always involve such angst. Such seems to be part of the point the authors make in the “balance” they offer. Depicting the city officials, they paint them as acting in good faith and competently something we view as very much in question in current situations such as Brooklyn’s Atlantic Yards megadevelopment or Columbia’s proposed takeover of West Harlem. generous sums for their homes which would enable them to improve their standard of living. Much of the controversy surrounding the takings clause concerns the question of how much compensation is “just.” This issue is largely fact-specific, presenting difficult but localized questions about how much one’s home or business is worth. In upholding the Poletown plan, the court wrote “The most important consideration in the case of eminent domain is the necessity of accomplishing some public good which is otherwise impracticable. . . The abstract right [of an individual] to make use of his own property in his own way is compelled to yield to the general comfort and protection of the community.” In effect, the court was saying, the law of eminent domain is a microcosm of the democratic principle of majority rule. We consider the last characterization in the authors’ own words, (In effect, the court was saying, the law of eminent domain is a microcosm of the democratic principle of majority rule. ), the most telling because this is a book about the Bill of Rights. Though the Bill of Rights is about individual rights there is no accompanying mention by the authors that the rights of the minority in the face of the majority are not about “majority rule.” If it were all about majority rule, the entire Bill of Rights would have no effect. 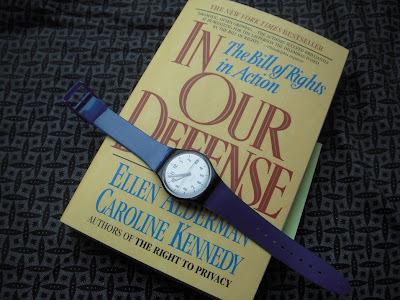 Though the full title of book Ms. Kennedy coauthored is“In Our Defense: The Bill of Rights in Action,” when it come to the Fifth Amendment’s taking clause, the chapter the authors provided does not make clear that the Fifth Amendment would ever provide a defense against a government taking. This is perhaps slightly addressed when the authors quote a dissenting justice. He denounced the majority’s “clear and significant public benefit” standard as too ambiguous. “The state taking clause has now been placed on a spectrum that admits of no principles and therefore no limits.” he wrote. The authors did not point out where we might draw the lines which might not be crossed. The authors do note, without connecting the dots for readers breezing along too fast, that while, as they reported, the court found that there was a "clear and significant public benefit" those benefits that were anticipated did not fully materialize. 6,000 jobs were projected. They report that only 3,000 materialized. Looking outside the four corners of the book (and with the hindsight of the additional years that have passed), it is now reported that though the GM plant is still in operation, it is significantly less successful than anticipated and that not even the 3,000 figure job level mentioned in the book was never actually achieved. It is also questionable whether the building of the plant (and the questionable economics of eminent domain) did anything to reverse Detroit’s decline. And as for General Motors, the Poletown caper did it no good in the long run. After consuming a fortune in public funds and years of shirking its duty to pay property taxes on the same basis as all other Detroit property owners, GM abandoned its hearquarters building, and moved to the Renaissance Center on the waterfront. In spite of its Poletown Cadillac plant,GM is now on the ropes, facing bankruptcy – some of its bonds are selling for around fifty cents on the dollar, yielding over 20%, ten times the fed funds rate. Though Alderman and Kennedy do not point out where the lines which should not be crossed might be drawn, the fact of the matter is that the case they wrote about was reversed in Michigan before Kelo was even decided by the U.S. Supreme Court. Kelo may actually go too far and draw the line in the wrong place (See: Saturday, June 28, 2008, Kelo case drew the line in the wrong place, Re: Pols Remain Masters of Domain.) but Kelo actually draws many lines that should not be crossed (See: Saturday, July 19, 2008, Reality Denied!). It is highly likely that if New York State’s eminent domain practices (which would not pass muster in Michigan) are reviewed at the Supreme Court level, say if the Supreme Court had granted certiori to the Atlantic Yards case, current New York practices will be disallowed. Whether or not a federal court disallows the practices that are currently going on in New York, it is important that they be stopped and they can be stopped at the state level, judicially or by our politicians. That is why the way Ms. Kennedy views things and her willingness to point out these distinctions is so important. Though distinctions such as these do not trouble the likes of Mayor Bloomberg they are distinctions to which we hope Ms. Kennedy would be attentive precisely because we rely upon state government for best practices in this area. . . We emphasize that nothing in our opinion precludes any State from placing further restrictions on its exercise of the takings power. Indeed, many States already impose "public use" requirements that are stricter than the federal baseline. Some of these requirements have been established as a matter of state constitutional law, while others are expressed in state eminent domain statutes that carefully limit the grounds upon which takings may be exercised. As the submissions of the parties and their amici make clear, the necessity and wisdom of using eminent domain to promote economic development are certainly matters of legitimate public debate. . .
We look mostly to the concurring opinion of Justice Kennedy (Ah, there’s that Kennedy name again, though unrelated) to serve “in our defense” when we need the protection under the Fifth Amendment’s taking clause: It sets forth many grounds for restricting the use of eminent domain for economic development. (Kennedy’s rules are an essential part of Kelo since without his fifth- vote concurrence Kelo would not have become law.) But we also pay attention to Justice Stevens and therefore would also look to the other Kennedy, our New York State Caroline, if she were appointed to represent us, just as we would look to anyone elected or appointed our senator. This is why it nags at us that, Bloomberg, who surely wants to use her as his pawn, cannot be trusted. New York State style eminent domain abuse currently exceeds that which happened in Poletown and is no longer allowed in Michigan. If we have a current New York example that might be close to Poletown, it could be the Columbia University expansion where a neighborhood is being turned over in toto to a single entity to further its particular enterprise and perhaps thereby economically assist the city. The difference is that, in Poletown, what was to be built was a single facility. In the case of Columbia it will be multiple facilities that are to be built unless “a campus,” built over many years, is viewed as the equivalent of a single manufacturing plant built all at once . . . notwithstanding that it was originally planned and recommended to be built as separate facilities integrated into the neighborhood. Unlike in what was reported Poletown, it was Columbia that picked out the neighborhood they wanted to acquire and evict. In the case of Atlantic Yards, not only won’t there be a single facility, there will be mostly no change of use as there was in Poletown. Perfectly sound and recently developed housing will be torn down to build housing. Mostly it is the change of ownership (a change to monopolistic ownership) that will be effected and most everything being done through the use eminent domain could have been accomplished by zoning changes. Further, in Atlantic Yards you have perhaps the clearest possible example of a developer-initialed and -driven megadevelopment. In Atlantic Yards there is ample evidence of bad faith and incompetence on the part of the government in assisting that private enterprise and putting a particular private entity’s goals ahead of the public. That includes the way in which competitive bidding was avoided and the accommodations in structuring the project to make it the maximum possible subsidy sponge, despite what that means in terms of poor design and oppressive density. Since so much is being torn down and left vacant for so long, and since the subsidies are so great, the argument of any economic benefit is conspicuously undermined or totally nonexistent. It would be nice if we knew where Caroline Kennedy stands on such abuses. If she stands where Bloomberg stands, which is probably what Wayne Barrett would warn us to suspect, we have a problem. That is not, however, as indicated in our previous post, what you would expect from a Kennedy family member. 31 percent of voters said they supported Mr. Cuomo, 24 percent Ms. Kennedy, 6 percent Representative Carolyn B. Maloney of Manhattan, 5 percent Representative Kirsten E. Gillibrand of the Albany area, and 2 percent Representative Steve Israel of Long Island. While there are those who feel Andrew Cuomo would make a fine senator, they are the same people who feel Cuomo is currently doing an excellent job as Attorney General. They are almost all also exceedingly wary of Assembly Speaker Sheldon Silver (who also has a culpable history on Atlantic Yards) and wary about what kind of attorney general Mr. Silver might appoint if Mr. Cuomo leaves that office. As we said when analogizing this to chess, the moves are complicated. Who is to say that Ms. Kennedy, though she starts out as an apparent Bloomberg pawn, won’t become a queen in our defense when she safely crosses to the other side of the board? The headlines are flying back and forth faster than you can keep track of them: Gehry is out and isn’t working on Atlantic Yards, - NO- Gehry is in- or NO- Maybe it is something else. . .
. . . Well, this article is about how supremely peculiar it would be if Forest City Ratner’s Atlantic Yards ever happens and if Frank Gehry is involved. It would be extremely peculiar if Gehry is involved even in the slightest residual way. These days it looks as if his role going forward may be just to shill for Forest City Ratner one more time, hoping to collect a small paycheck just to deny that he truly isn’t going to be not involved with the dying project. This article is about spirit and about the spirit of the land. Why would it be supremely peculiar if this megaproject was built with a Gehry connection? Because perhaps its construction would come with one more spiritual curse than we presently imagine falling on the head of Mr. Ratner and Mr. Gehry. Bear with us and we will describe a very strange coincidence. According to Lakota elder Vine Deloria Jr., there are many different kinds of sacred places, and they all come “out of a lot of experience. The idea is not to pretent to own it, not to exploit it, but to respect it.”* The kind of sacred place that is most difficult for non-Indians to understand teaches and gives to humans, who are in turn obligated to preserve it as a healthy place. “The creed of the Lakotas,” says one observer, “requires not a general reverence for land (though that is a near-certain outgrowth of it) but a particular attentiveness to place”** In such a framework, the very modern term land use seems jolting. If there is an organic tie between land and people, how can it be “used”? When we first read these New York for Sale passages we never thought we would be quoting them here in Noticing New York, but here we are and we are glad for the chance to work in this mention of Mr. Angotti’s book before we, in a future post, get to a discussion of some of the book’s other more major themes. As the book title indicates, much of it is about the selling off of New York’s public realm at the expense of our communities. Why are we writing about the spirit that travels with land? Because of this coincidence that came to our attention: once upon a time a branch of our family married into the Cruger Family. The Crugers are connected in many ways with the history of New York. 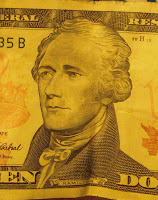 One Cruger, Nicholas Cruger, raised Alexander Hamilton and is sometimes referred to as his political mentor. (We can thank Alexander Hamilton both for the fact that New York is not the capital of the U.S. government but is its financial capital.) Nicholas had an uncle who was a member of Parliament. Two other Crugers, a father and son both named John, were mayors of the city. One of them was a member of the Stamp Act Congress before the Revolution. Unfortunately, another Cruger ancestor, John Barker Church, bought the set dueling pistols that killed both Hamilton and Hamilton’s son Phillip (in 1801). Church, himself, used them previously in a 1799 duel with Burr in which neither Church nor Burr were injured. The Crugers are the family for whom Crugers Avenue in the Bronx is named, the family for whom Crugers, New York is named; their family tree and relations included the Van Cortlands for whom Van Cortland Park is named and the Van Rensselaer family for whom Rensselaer, New York was named. (Rensselaer is where you get off the train when you go to Albany.) The Crugers were also descended from Governor Paterson (not New York’s) but William Paterson, the second Governor of New Jersey, signer of the Constitution, and Supreme Court Justice for whom Paterson, New Jersey is named. Lastly, and important to this story, the Crugers are the family for whom Crugers Island in the Hudson is named. The Crugers were an interesting family, but not everything about them was good. There was some slave trading at one point. Why is all of this important? Because of what happened to Crugers Island. The Crugers who lived on Crugers Island fell on hard times. In the end the house on the island was inhabited in a run down state by two old beggered spinster sisters, Catherine Church Cruger and Cornelia Cruger. They died respectively in 1914 and 1922. After that, Crugers Island became the property of the Ward family; in 1926 the property was bought by Robert Boyd Ward. Lessons from the Ward Bakery demo and Tuesday, December 9, 2008, Times Coverage of Landmarks Preservation Commission: The Pieces Needing to Fall Into Place) Now with buildings in the neighborhood leveled Ratner is trying to bait and switch and foist cheaply constructed alternatives upon the public. (See: January 15, 2009, Editorial: Bait and switch, The Brooklyn Paper). And Gehry? As we know, Gehry has been the architect providing cover and shilling for all this destruction. There is more to tell you. Here is where the irony and the coincidence deepen. The Ward family did not own the island long. 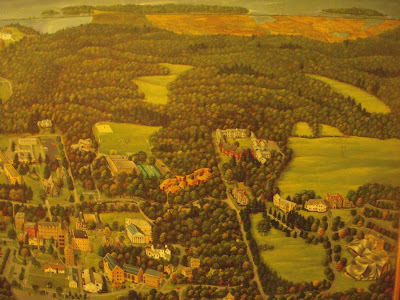 It became part of a thousand-acre parcel of land that Mr. Ward conveyed for philanthropic purposes to the New York Society for Improving the Condition of the Poor. For years the land was used for all sorts of good things, the Ward mansion became a home for the aged, there were boys and girls camps, there were bungalows that were rented at exceedingly low rent so that poor families could vacation in the summer. It was a large tract of land. Some things that night have happened didn’t. At one point it was proposed to build a nuclear power plant on a portion of the land. That didn’t happen; a reminder that not everything that an irresponsible government proposes should be built, gets built. Here is what happened to a 90-acre portion of the land, including Crugers Island. It was conveyed to Bard College in the early 1960's. 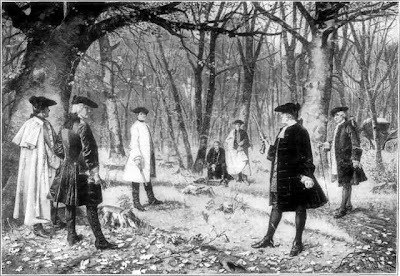 In one way that may bring us back full circle to the Crugers because the Crugers and the Bard family intermarried and one of the Bard family members, an in-law, (Judge Nathaniel Pendleton), was Alexander Hamilton’s second in his fatal duel with Aaron Burr which occurred July 11, 1804. 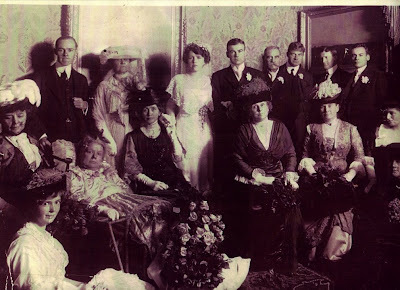 (James ("Jim") Pendleton Cruger, born in 1860, is the member or the Cruger family our relative married.- Here is a picture of our grandmother attending his daughter Amy’s October 26, 1912 wedding. Also in the picture is the Manhattan District Attorney, brother of a U.S. Attorney General and Secretary of State. Not Fond of Gehry: Does Huxtable Have a Blind Spot? Frank Gehry has often said that he likes to forge deep emotional bonds with his architecture projects. But the commission to renovate the Art Gallery of Ontario here must have been especially fraught for him. Mr. Gehry grew up on a windy, tree-lined street in a working-class neighborhood not far from the museum. His grandmother lived around the corner, where she kept live carp handy in the bathtub for making her gefilte fish. Given that this is Mr. Gehry’s first commission in his native city, you might expect the building to be a surreal kind of self-reckoning, a voyage through the architect’s subconscious.
. . . this may be one of Mr. Gehry’s most gentle and self-possessed designs. . .an ability to balance exuberance with delicious moments of restraint . . Mr. Gehry doesn’t put art on a pedestal . . . The rest of the design unfolds in a meandering, almost childlike narrative. . . . Mr. Gehry shows the most restraint in . . Mr. Gehry seems to have had more fun with . . .
And suddenly you grasp what’s so moving about this place, despite its flaws. The exuberance is here, of course. But something else tugs at you: the architect’s humility in addressing the past. We think that the art of architecture should be about creating something that takes into account how the rest of us will “live with” it as Ms. Huxtable said, and which should be much less about an exploration or working through of the individual artist’s personal psychology and emotions. Architecture is an art that needs to focus on the relationship to the greater public and their lives. But somewhere along the way that fantasy took a wrong turn. As commissions multiplied for luxury residential high-rises, high-end boutiques and corporate offices . . . . more socially conscious projects rarely materialized. . . . Serious architecture was beginning to look like a service for the rich, like private jets and spa treatments. Nowhere was that poisonous cocktail of vanity and self-delusion more visible than in Manhattan. Although some important cultural projects were commissioned, this era will probably be remembered as much for its vulgarity as its ambition. Every major architect in the world, it seemed, was designing an exclusive residential building here. . . .
Now that high-end bubble has popped, and it is unlikely to return anytime soon. . . . . . Even if the economy turns around, the public’s tolerance for outsize architectural statements that serve the rich and self-absorbed has already been pretty much exhausted. Firms like Forest City Ratner and the Related Companies, which once worked exclusively with corporations that were more adept at handling big budgets than at architectural innovation, seized on these innovators as part of a shrewd business strategy. The architect’s prestige would not only win over discerning consumers but also persuade planning boards to accede to large-scale urban projects like, say, Mr. Gehry’s Atlantic Yards in Brooklyn. We think that Gehry’s overall work is now receiving reassessment. Much of that reassessment has likely come about because of Atlantic Yards and its destructiveness to the community. Many, like ourselves, are inclined to consider that Mr. Gehry has been behaving irresponsibly in connection with Atlantic Yards and the cover he gave to such things as the destruction of the Ward Bakery Building. Therefore, we are probably less inclined to share the charitable opinions Mr. Gehry gets from old friends who knew him on his way up. One story of the performance center’s enjoyment that created quite an image in our mind’s eye especially after seeing the performance center. We had described to us a dance that had been performed on the roof by students using bungee cords. We are great fans of site-specific dance works and commented that we would have liked to see this. It must have been spectacular to behold. It intrigues us that the building inspired the work. We have written before about the odd urge of humans to conquer through climbing and acrobatics some of our odder new architecture: Philippe Petit's famous 1974 tightrope walk between the Twin Towers, the climbing of buildings including the three climbers (in five weeks) who climbed New York’s new third-tallest building, the New York Times Tower, and George Willig’s climbing of the Twin Towers and (with my brother) his climbing of the Unisphere in Flushing Meadow Park. (See: Tuesday, August 5, 2008, TWO, AND FRO?) We have observed that perhaps in their very oddness many of these buildings pose special problems in our relationships with them such that we now seek to conquer and tame then with performances such as these. Our taxi driver told us about the bungee-cord dance on the performance center’s roof. He told us another story about the performance center’s roof. He told us that he had been making many trips ferrying building contractors out to the performance center to address the fact that the $62 million performance center’s rook leaks. He said that the engineers explained that there was a problem with the five-year-old roof because Gehry’s design specifications did not take into account the variability of the climate. He said he was told that the building was designed for a more temperate climate where, unlike our own northern climate, wide fluctuations in temperature don’t cause expansion and contraction that needs to be addressed and provided for. In Conclusion: Is it Superstitious to Put These Coincidences Together in the Form of Fable? What are we to make this? Are we superstitious about coincidences? Do we think that spirits that may travel with the land? There seems a fabulous tale here. Once upon a time, a philanthropic Mr. Ward gave away land. 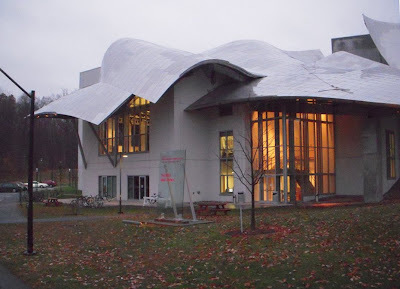 It was an act of generosity from which Mr. Gehry ultimately benefitted because, through the good graces of fate, Bard College was eventually able to offer, with that land, an opportunity to Mr. Gehry to prove himself. 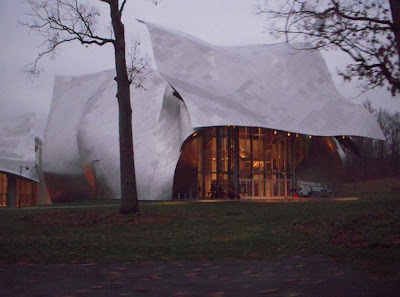 Almost as in a fairy tale, Gehry was acclaimed for his work there. It was almost as if his life was charmed. Wherever he might have earned it, in this or a previous life, he seemed to be followed by good karma. His work was charitably viewed and well received. It seemed as if this good fortune might continue forever. Then one day there was the opportunity for another legacy to flow through land the Wards had once owned. 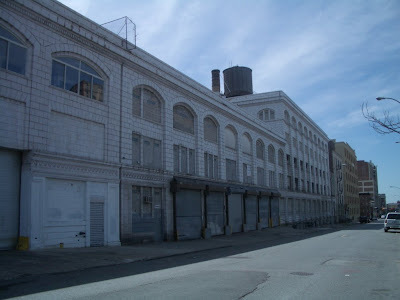 The spirit of the land could again flow through benefit to the community The magnificent white terra cotta Ward Bakery Building with its fairy tale repeating arches could have been adaptively reused to astonishingly benefit the community of Brooklyn. The building could have stood sturdy and worthwhile as a reminder that we love our history (can you tell we love our history? ), and it could have been a vision rising up as one side of a Ward public park that could have a prime feature in the development of the Vanderbilt Railyards. (This rather than the Atlantic Yards plan). Instead, along comes the villain of the story, an evil Mr. Ratner. He wants to attack and destroy the community out of personal greed. To do so he wants to destroy Mr. Ward’s beautiful bakery. He is unable to do so without an ally to disguise the face of evilness. That is when he approaches Mr. Gehry with a deal: Will Mr. Gehry help disguise his scheme? In exchange he will give Mr. Gehry more money than he ever dreamed. “I'm tired of Mr. Gehry,” said our friend. “I don’t need to know anything more about him or the way he works. I know how he works. It’s like this. . “ he reached into his pocket “. 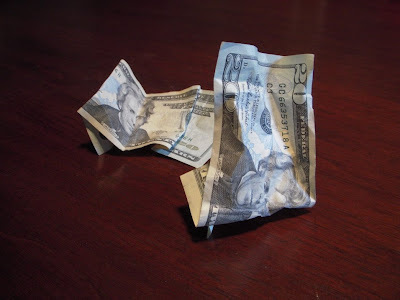 . . Inspiration!” He held up a twenty dollar bill and waved it in front our face. Then he took the bill, passed his hand over it rather like a magician doing a trick would and, a second later, the bill, crumpled over, was tossed out onto the bar. “Inspiration” he declared triumphantly. The now crumpled bill sat on the bar at Freddy’s (within the proposed Atlantic Yards footprint) looking rather like one of the Gehry buildings Ratner wanted to slam down on that very site. The end of the fable is that Gehry took the money from the evil Mr. Ratner and betrayed the community. He did not listen to the whispering spirit of the land from which he had once received benefit. He did not remember that, as an architect, he had a special charge: He should be thinking about the community for whom he should build. He was under the spell of self-absorption, thinking erroneously that he himself was the source of all his powers. He took the money. And it may be that in so doing he cut off the spirit of land from which generous benefit, good will and luck were flowing to him. It may be that something started on the day of his betrayal. It may be that, as a result of the choice he made that day, Mr. Gehry will be viewed differently, . . . And so it will be forever after. Perhaps the spirit of the land is so strong it goes beyond just Gehry. Politicians considering Atlantic Yards may need to consider tokens of what is imbued in the land as well. How strong is the magic that is mixed in and now flows with the land? It may be strong indeed: Crugers Island floats in the same Hudson river that Hamilton crossed for his fateful duel and which he thereupon crossed again afterwards mortally wounded. The south of Crugers Island was once inexplicably the site of Mayan sculptures (ultimately passed into the hands of the Natural History Museum) bought from Yucatan Indians in 1688 by Cruger ancestor Peter Schuyler and arranged for rites on the island in the form of ruined church. Politicians beware: If your destination is “Albany,” you arrive there on the other side of the river in Rensselear, land named for Cruger ancestors. The ancestral blood of two New York mayors is connected to the spirit of this land: Should not present-day mayors (and all those who aspire to that office) take heed and make sure to do the right thing when it comes to Atlantic Yards? Should not all politicians take sober heed to honor the legacy of the Wards? Here is Noticing New York’s testimony given at today’s hearing on proposed issuance of $515 million additional tax-exempt bonds to finance the Yankee and Mets Stadiums. Additional observations about the hearing follow afterward. We would like to have provided lengthier, more thorough testimony. What is provided below is much less than ten minutes of testimony and much closer to three. As it was, there was a question as to whether we would be required to terminate our remarks before completion. We were able to complete oral delivery of the written testimony below which we also handed in. Re: Today’s hearing on proposed issuance of $515 million additional tax-exempt bonds to finance the Yankee and Mets Stadiums. This testimony is presented in the name of Noticing New York, which addresses itself to issues of what is good public policy and planning critical to New York development issues. Our testimony must, in large part, address the very legitimacy of this hearing. 1. We submit to you that this hearing does not meet met the minimum statutory requirements for validity since the required ten day notice was not actually given. 2. 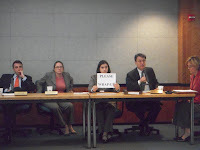 The presupposed purpose of any hearing should be to actually hear, listen to, consider, evaluate and take into account any testimony presented at that hearing, but the fact that the vote on this matter is scheduled for just one day later clearly shows that the IDA has already decided what it wants to do, that this hearing is perfunctory and that there is no intent to actually “hear” or consider what is said here. 3. 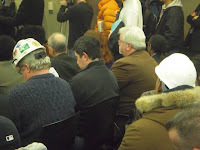 If this hearing was intended to engender honest evaluation of the cost-benefit of issuing additional bonds, the IDA and Mayor Bloomberg would not be obfuscating and misinforming the public about those costs and benefits. For example, information made available would clearly have specified what possible benefit there might be to issuing additional bonds (we think there is none) rather than conflating this with arguments about the benefit of having already issued the original bonds. For example, the Mayor and the IDA mislead the public to believe that costs would only be borne by the federal government and not by the state and city. 4. We question why the IDA provided such cost-benefit information as it did only at the last possible moment. It is only last night that we were able to learn that the city’s Independent Budget Office’s current estimate that the cost of Yankee Stadium now being picked up by the taxpayers is $854.7 million. For the Mets, the IBO calculated cost to the public is now $371.5 million. But that is without even counting the fact that neither team will be paying property taxes. 5. We don’t understand why the IBO, Mayor Bloomberg or anyone else would exclude real property taxes not being paid to the city as a cost to the public of these projects unless we are talking about the portion of those taxes under PILOT agreement, (the R-TIFC-PILOT agreement) which actually represent fake taxes due to a consciously and illegally contrived overvaluation tax assessment of the Yankee Stadium property. We do not know why anyone would consider buying the proposed additional Yankee Stadium bonds since this manipulated overvaluation makes those bonds taxable (as bonds now outstanding are also likely to be taxable too). 6. Clearly, the IDA’s and the Mayor’s focus in negotiating these transactions has been misplaced as exemplified by the documented pursuit of a luxury suite (plus food) for city officials at exorbitant cost to the public. Relinquishment of the luxury suite has not made those costs go away. If anything the full price paid for by the public has been underestimated. 7. The stadiums have already been built. Issuance of additional bonds will not change this nor whether the baseball teams involved would ever threaten to leave either pretextually or for real. Financing additional luxuries at the stadiums induces no additional public benefit. It is only a way heap more financial benefit on those already flush with benefit. If there is any value to building these things they can and will be built by the teams themselves at their own expense rather than the public. In other words, paid for the old-fashioned way. That is what can and should happen. 8. When we were preparing this testimony the IDA could not inform us, even a day before the hearing, how long we would be afforded to speak. We noted that the federal regulations for hearing on federal tax-exempt private activity bonds require that each speaker be afforded at least ten minutes speaking time. 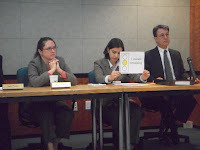 Despite a number of efforts, we could find no one at the IDA to tell us how long we would be permitted to speak. Attached* is Noticing New York’s most recently published comment on the IDA’s issuance of these bonds. For greater depth, that piece refers and links to other previous commentary. The hearing, scheduled to begin at 10:00 AM, lasted almost three and half hours, ending just before 1:30. It was reasonably well attended. 1. Good government organizations and citizens who had scrutinized the relevant issues and were speaking quite universally against the issuance of the additional bonds. 3. Organizations that had been the object of Yankee organization marketing initiatives, sometimes including some small-scale donations from the Yankees. One observer at the hearing commented how oblivious these groups seemed to how little they were getting compared to what the Yankees are getting. The observer likened it to the image of someone standing blithely on a twenty dollar bill while bending over to pick up a penny. 4. A few local politicians who signed onto the stadium deals (apparently come hell or high water). 5. The dependable construction workers and their relatives in the construction industry. As usual, there sure were a lot of them. They just don’t seem to get it, that when they are uncritically and automatically available for rent as stage props by wealthy people seeking to fleece the taxpayer, their opinions no longer mean anything. We wish they were reading the writings of Gregory A. Butler, a union carpenter who analyzes what kind of sense this doesn’t make. 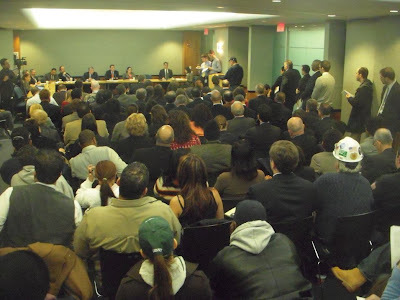 (See: Tuesday, January 06, 2009, Militant union carpenter: unions shouldn't compromise with contractors or support Atlantic Yards.) Not only can bussed-in construction workers routinely be counted upon to support bad public policy that hurts the public; this often means that those construction workers support projects using public resources so poorly that fewer rather than more union jobs are created than might be with alternatives. Most of those who spoke in favor of piling additional money on the stadium owners spoke in a very rah-rah superficial fashion. It was on the order of letting us know that if the Yankees are playing a game they are out there rooting for them because the Yankees are the home team that they always root for. This seemed to translate seamlessly into thinking that if the Yankees are playing a game of tax loopholes, they are rooting for them to win that game as well even if it means the public loses. Some of it was oxymoronic. One speaker praised the Yankees for being so loyal to the Bronx that they never left, but argued that we need to give them money or else they might, in fact, leave. 1. The testimony of Good Jobs New York with their most recent analysis of the figures. Current documentation shows that only perhaps 57 additional permanent jobs are being created by the $854.7 million in public subsidy (exclusive of the real property taxes not being paid) that the IDA seeks to direct to Yankee Stadium. There are also part-time jobs like ticket sellers and takers for the relatively few days a year the stadium is used. The Yankees promise over 6,000 construction jobs. But once their new house is built, there could be as few as 22 full-time, year-round positions. What makes this latest request feel like “icing on the cake,” as Assemblyman Richard Brodsky puts it, is that the rest of the city is staring at such hard times and a looming $1.5 billion budget deficit. Mayor Bloomberg has — rightly — had to cut city budgets and increase property taxes and explain to residents how times are bad and how we all will have to share the pain. It is time for Mr. Bloomberg to make that same pitch to the Yankees.